Sleep problems and anxiety are closely intertwined and often caused by the same things, such as stress, poor diet, or hormonal imbalance. People who are prone to anxious feelings will often find insomnia is a natural consequence of worry, and those with sleep problems might start to feel anxious about their lack of sleep. There are various ways to deal with these problems at home, and many natural remedies will help both sleep and anxiety problems. These include lifestyle changes and certain herbs. Keep reading for a list of the best home remedies. It is generally recommended that adults between 19 and 64 years of age do at least 150 minutes of moderate exercise every week. Physical activity is useful against anxiety because it encourages the release of serotonin and endorphines, neurotransmitters that elevate mood. It has also been linked to the extra benefit of fostering better sleep. Both anxious and sleep-deprived individuals can benefit from taking up an activity like cycling, swimming, or aerobics. This exercise involves focusing only on your breathing, which might take a bit of getting used to at first, but the rewards are worth the effort. First, find a quiet place where you won't be disturbed. Sit down and start to focus on your breathing. Breathe in deeply, counting from one to five, and then breathe out slowly for five seconds. Try to do this for 5 - 10 minutes at least twice a day. Alongside these lifestyle adjustments, it can also be helpful to take an herbal supplement in order to speed up relief from anxiety or insomnia. Listed below are some herbs that can be effective for such issues. This is a popular herbal remedy used for the treatment of low mood and relief from the symptoms associated with sleep problems. It is not exactly clear how this herb works, but it is thought to prolong the action of serotonin in the brain. This plant is widely cultivated for medical use. Valerian has a relaxing effect, particularly effective in treating stress and anxiety. Many people also find it useful to encourage sleep, as its calming effect on the brain and the body helps sleep to occur naturally. However, you should not take this herb at the same time as other sleep-inducing medications. Macafem is a 100% natural supplement that helps alleviate menopausal symptoms. It has long been used for its ability to restore hormonal balance. Macafem nourishes your endocrine system, so your hormone production can maintain balance naturally. 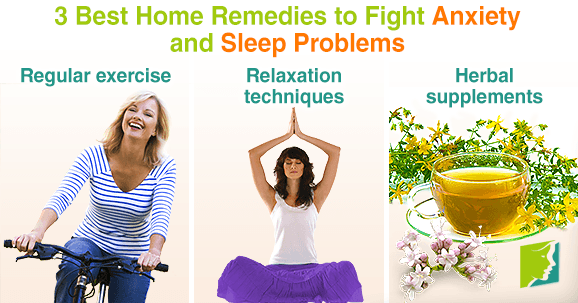 Although anxiety and sleep problems are disruptive, it is generally possible to manage these issues through simple home remedies. Medical support might be needed further down the line should symptoms persist, but it's best to try simple natural remedies before resorting to more serious medications.